Haplogroups mark the migration from common ancestors to distinct regional populations. 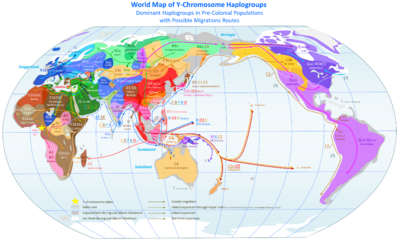 Dominant Y-chromosome haplogroups in pre-colonial world populations, with possible migrations routes according to the Coastal Migration Model. Haplogroup Y (Y-DNA) is the root of the Y Chromosome Haplogroup Tree. This blog summary of the human genographic project from national geographic is well written. The paper [PMID 18385274 ] is currently the best reference for the Y chromosome. The supplemental material is available at  and is sufficient for determining a reasonable collection of snps for the criteria of a genoset which recognizes a haplogroup. provides a nice poster although it lacks the mapping to rs#. The Y-chromosome has a lower SNP mutation rate than mtDNA. There was a recomendation from the Y-chromosome consortium, YCC, to change to a short hand. That is to write R-P312 rather than R1b1b2a1a2.